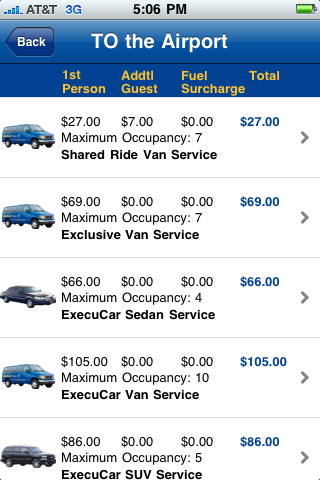 Super Shuttle/Execucar IPhone App Debuts in the App Store! Hello all my travel/technology fans! Jerm here with an IPhone app update for you from one of our Tampa Bay & Company partners! For those off you who didn&apos;t know, I spent about 12 hours yesterday at the Apple Store at International Plaza waiting in line to get the new IPhone 4, so I was super excited to see that one of our local partners jumped on the App bandwagon with me! Ever been in need of a lift? With the new SuperShuttle App, that task of getting a ride to and from Tampa International airport just got much easier. Whether you need a ride from you’re home, at the office, in your hotel room, or at your airline’s gate, with the SuperShuttle App you can now easily get a fare quote, book, and or cancel your airport ride from your iPhone. This awesome new App also provides you with the location of your assigned vehicle by incorporating the SuperShuttle “Where’s My Van?” Google map locator function. So whether you need a pick from the beautiful Westshore District, or a ride from one of our famed local Tampa Florida attractions, they got you covered. There is an extra benefit for us IPhone users as we can also participate in the Summer Lift program featuring family discounts with five dollar rides and double airline miles on SuperShuttle. Sounds like a pretty cool app to me, and with all of the travel I do, it will definitely come in handy! That&apos;s it for now, but be sure to stay tuned in for updates from Jerm and the the Tampa Bay team!